After 30 years working as a supporting artist (on and off - although more off than on) I have decided to start this blog talking about the work pitfalls and highlights. This is obviously based on my experience and other collegues views may differ.
" An Artist who appears in vision who shall not be required to give individual characterisation or speak any dialogue except that crowd noises shall not be deemed to be dialogue in this context"
"A Walk-On Artist shall be an individual who is required to exercise their professional skills in relation to a cast actor and/ or in close-up to camera and be required to impersonate an identifiable individual and/or speak a few unimportant words where the precise words spoken do not have an effect on the overall script or outcome of the story". Think Jane Slaughter who for nearly 30 years appeared in the recurring non speaking role of 'Tracy', the Barmaid of The Vic in Eastenders. Most Background Artists will do a mix of Supporting and Walk-On work. The information provided is generally for past productions rather than current or future productions.This is due to the limitations of the non-disclosire agreements that we sign up to on most productions. These non-disclosure agreements are designed to prevent plot leaks, costume and set picture leaks and unofficial cast information. The more expensive the film generally the tighter the security to prevent these leaks. To help reduce the chance of leaked footage or unauthorised cast photos mobile phones are generally banned from set and sometime even from the holding areas off set. For Mission Impossible: Fallout all phones had security labels placed over the cameras while on Jurassic World: Fallen Kingdom phones were taken off supporting artistes when they registered for the day and locked up until the days filming had finished. For films where the security is not so tight long socks or bras provide a safe and secure hiding place for mobile phones (provided they are turned off or on airline mode). If the costume is loose I have been known to wear cargo shorts under costumes (more of this at a later date). The idea of my doing Supporting Artist work came at the suggestion of my then singing teacher, Mollie Petrie, who was already working in that field and who thought it would be good for me as I was, and still remain, somewhat of an introvert. 30 years later there is no longer a closed shop which means that there are now approx 50K registered supporting artists fighting it out for limited places. My first apperances were in the 2nd series of a new hopsital drama called ' Casualty' (1987) and in a horror mini series initally called 'Gor' but later renamed 'First Born' (1988). The first stage on the ladder is to register with an Agent. Some agents charge a fee for you to go on their books while others deduct the 'book fee' from your first pay packets. While you have an agent, or agents, you remain self employed, so there is no minium wage, holiday or sick pay. In addition to the 'book fee' the agent also deducts their commission from any earnings. It is always important to consider these deductions plus travel and accommodation costs (if applicable) when deciding if a potential filming job is worth the fee being promised.. When you are a professional supporting artist, meaning that you are registered self employed and listed with the inland Revenue, then the potential profit/loss of filming is paramount. If you are a hobbyist or part time Supporting Artist (or SA), then sometimes the calibre of the film or stars will influence your decision even if it means making a loss. Certaining appearing in a James Bond or Mission Impossible film has enough pull for most SA's to accept this work as a loss leader. Can you rise from SA to proper Actor ?. In the end it depends on talent and luck. There are many SAs who consider themselves Actors already. (Inflated ego's are common in the business). Background Artists who have become well known actors include Brad Pitt, Channing Tatum, David Niven, Renee Zellwegger, Matt Damon, Syvester Stallone, Megan Fox, Michael Caine and Bruce Willis. Can you make a living from solely being a Suppporting Artist (SA) ? Some will tell you yes but these people have often only been in the business for 12 - 18 months and may be having a good year as a new face. As a 30 year veteran I would say NO, not if that is all you are doing. If you are mixing it with paid stage work, voice over, stunt work or other TV/film based technical work then you probably can ... but it is rare. In my 30 years I had a lull of 4 years when no SA work was forthcoming and would not have survived without a proper job.. When is a booking not a booking? 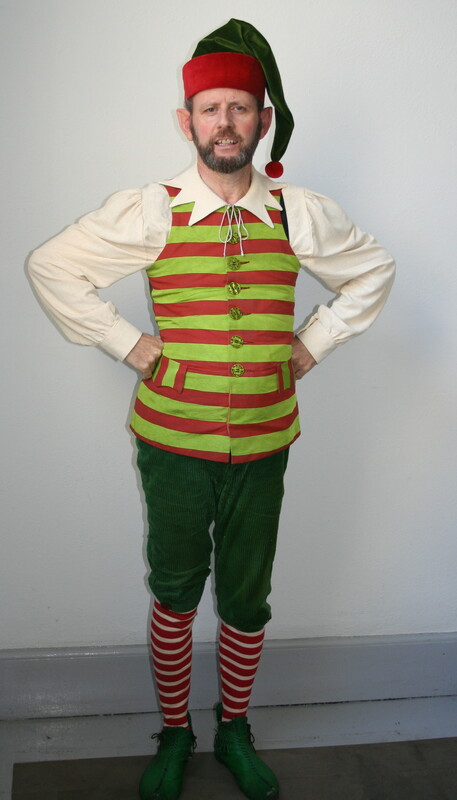 Phillip Tolley as an Elf in 'Fred Claus' (2007) - complete with prostetic ears..